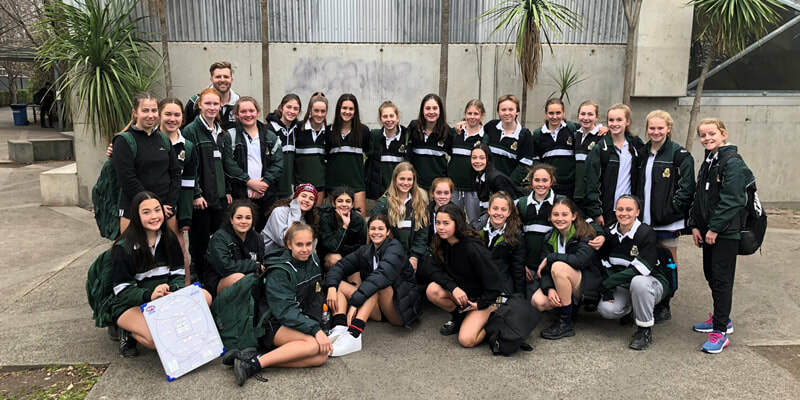 ​Two fantastic games of football were fought out by an eager team of 29 girls against the windy conditions in Airport West last Friday. On the day, the year seven and eight girls were determined to perform their best, organising themselves into warm ups lead by captains Eva and Alexis. Playing in game one were girls of mixed ages and differing football experience, who despite never before competing together, played a fierce game against Rosehill, with every player contributing with skill and endeavor. As a team, the girls kept much of the contest in their forward. The players Charlotte H, Danielle, and Sarah rewarded their efforts by each kicking an impressive goal. Their battle continued to the back line where our defence limited Rosehill to a comfortable 14 points. In the last quarter, Strathmore competed against strong winds, but still finished the match with 38 points, winning against Rosehill by 14. Thrilled with their victory, the girls lost no momentum and played their second game against Buckley. Undeterred by the wind, the girls got off to a great start, and were consistent through all four quarters. In total, the team scored an exciting seven goals and only three behinds; a margin to be proud of. After only letting in one goal from Buckley, the team won very convincingly, concluding their day. Mikaela, Maddy, Kayley, Alexis, Charlotte and Tess scored our goals during the second game. Over the weeks of training, it was great to see so many girls passionate about football. The skill level that Strathmore’s team has acquired is exceptional, only proving how female football has established.